On November 20th, the Trump administration announced that it was ending Temporary Protected Status (TPS) for more than 60,000 Haitians who came to the U.S. after a devastating earthquake in 2010. This announcement came after the administration ended TPS for Nicaragua and announced that it was uncertain about the future of TPS for Honduras and El Salvador. This move by the administration will have a significant impact on hundreds of thousands of children and families. Collectively, TPS recipients have more than 273,000 U.S. citizen children. These children live in mixed status households and now face the fear and anxiety of being separated from their loved ones. 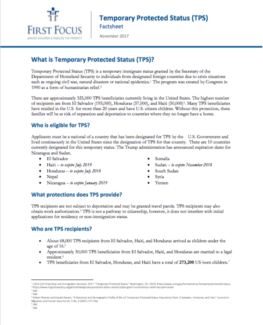 Additionally, TPS recipients have legally been allowed to work and provide for their families, if their work authorization is revoked they will be forced into the shadows of a country that once offered them hope.